With constant increase of Activations Android will accomblish 1 million device activations each day. The rapid growth of Google mobile operating system Android was confirmed by chief developer Andy Rubin who talks of more than 500.000 Android-device activations day by day. According to Rubin this is equivalent to a 4.4% growth each week. If Android will keep on track for the next few months, by end of october Android will reach 1 million daly device activations. At Google I/O mid may Google talked about 400.000 devices per day. Apple in comparison has sold 366.000 iOS devices pery day (before iPhone 4 was available for Verizon network). Actual numbers are not known. In September 2010 Apple has activated 230.000 iOS devices. 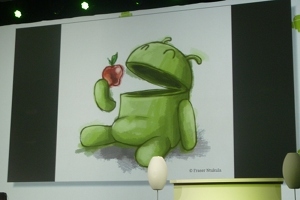 While Google Android grows more than 200 percent, Apple has increased in the same period of time by 60 percent. Apples growth will properbly increase during the introduction of the next generation iPhones (iPone 4S and iPhone 5). The market reseach institude IDC has announced an marked share of the Windows Phone 7 20.3 percent by 2015. But currently no official numbers are published by Microsoft. Blogger Eldar Murtazin, has reported that the company has only sold 674.000 devices in the last year. In Jannuary Microsoft reported a delivery of 2 million smart phones to providers - but sales volumes were not mentioned. According to estimations by Gartner, 1.6 million smart phones with Windows phone 7 operating system have been sold during the first quater of 2011. Market resarchers assume that an increase of sell figures will not happen until the launch of the first Nokia devices with Windows Phone 7.